The constellations now known as Carina (the Keel), Puppis (the Stern), Pyxis (Compass) and Vela (the Sails) all belonged to a gigantic constellation called Argo. Its story goes like this. Each map can be clicked on to produce a 916x1149 version of it. They sport red labels, which look good on screen, but which disappear when used with red flashlights. Each map, therefore has a second link to a map better suited for printing in a graphics program, and using in the field. While they are quite large, they are all about 40-60k, and so are easy to view at today's modem speeds. The first map is a wide area view of the constellation, suitable for naked eye browsing. The next views are binocular width, showing stars to mag. 10, and labeling deepsky objects to magnitude 12. Click the map for a 916x1149 version of the above. Click here for a map better suited for use in the field. 35k JPEG Here is a description of NGC2818 from the 2000 Plus Catalog (with corrections): "8M; 9' diameter; 40-plus 9M and dimmer members in a weakly concentrated mass; see, also, embedded bipolar PL NEB N2818a (12M; 38" diameter; a.k.a. PK 261+8.1) which looks at high power (>300x) like a miniature Dumbbell (M27); find the duo 7° N and a bit E of 2M Lambda VEL, just 1° N of a small knot of three 5-6-7M stars." A remarkable object, because the planetary actually belongs to the cluster, unlike M46, where the planetary is a foreground object. 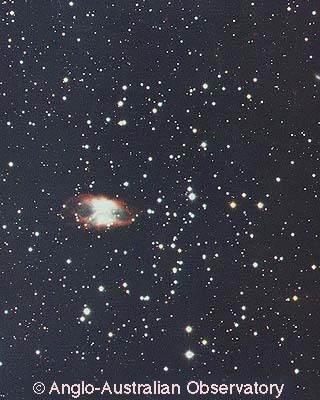 Image by David Malin from the Anglo-Australian Telescope. 88k JPEG NGC2627 (Bennett 40) is a mag. 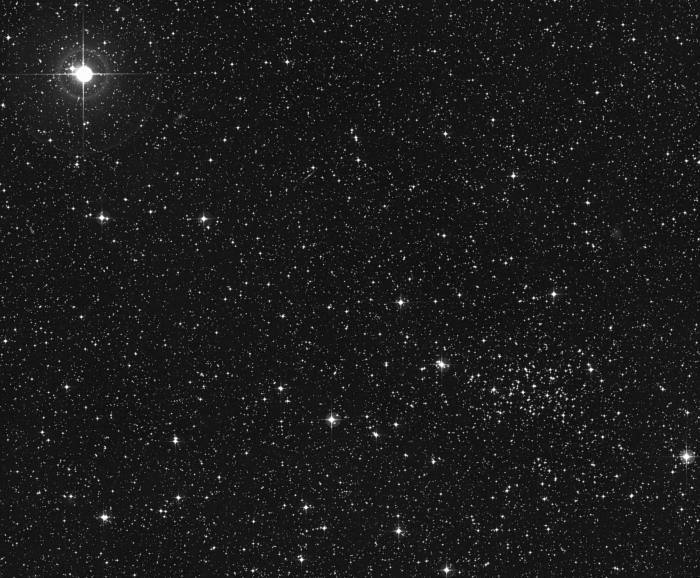 8 open cluster located in western Pyxis, about 40' south-west of Zeta Pyxidis (it's the bright star in the top, left of the digital Sky Survey image). The NGC description reads: quite large, richer and more compressed toward the west, with about 40 stars of magnitude 11 to 13.